Mid-Atlantic Gateway: Memorabilia from "The Tournament"
There are several note about this poster. The poster promises 17 matches, but there were only 15 matches scheduled all along. perhaps the person making up the poster actually meant 17 participants, since that is what is listed there. But the tournament only featured 16 participants, which was normal for the evenly distributed single elimination four-round tournament. The only person not appearing on this show that was announced on this poster was Ray Stevens, who reportedly had transportation problems out of Atlanta. He was replaced in the tournament by Johnny Weaver. Though Tim Woods was announced on the poster, he did not wrestle in the tournament. He was, however, involved that night playing a part in the disputed finish of the Blackjack Mulligan vs. Dusty Rhodes quarterfinal contest. You may recall that Woods was in the same plane crash that ended the career of Johnny Valentine that led to this tournament. 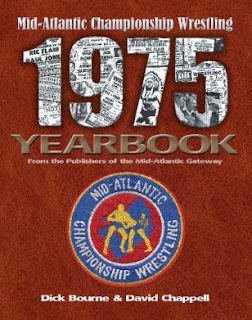 While Woods was fortunate to not be injured nearly as badly as Valentine and others on that plane, he was in no shape only one month later to wrestle in the tournament. Blooper note: Red "Bastion" should have been (of course) Red Bastien. Thanks to John Hitchcock who allowed us to photograph this poster from his collection many years ago. 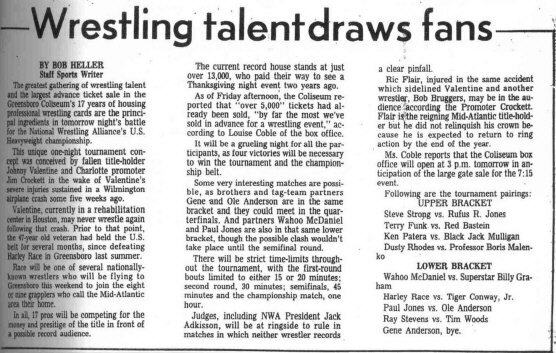 The most notable thing about the newspaper ad for the tournament (at left) is that the eventual winner Terry Funk was not listed as a participant! it makes you wonder if Funk's participation was relatively a late development. 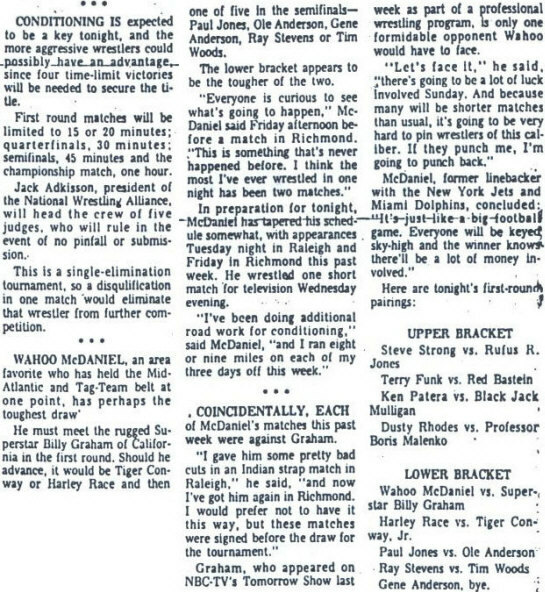 The articles below appeared in the Greensboro News & Record prior to the the tournament. It was written by staff sports writer Bob Heller, who did an excellent job on both this piece as well as the story that followed the tournament. (2) Tom Woods was there, but did not participate in the tournament. 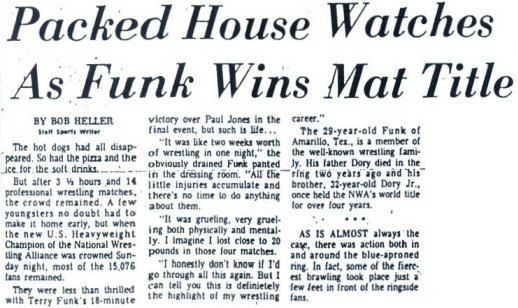 (3) Terry Funk, not in the ad, filled the open 16th slot vacated by Woods. 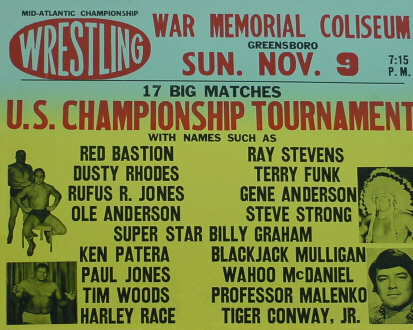 Despite the huge talent roster, ticket prices remained the same - $5 and $6! Thanks as always to Mark Eastridge who provides the majority of the newspaper clippings you see on the Mid-Atlantic Gateway. 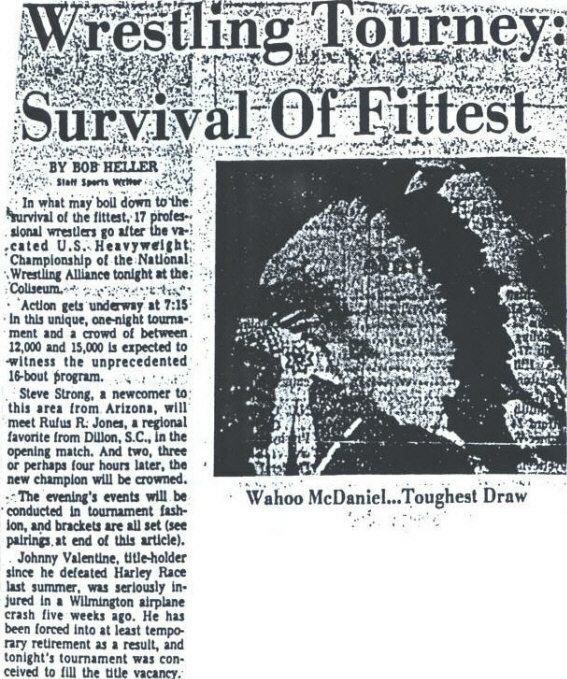 The article in the Greensboro newspaper the day before the tournament.